Rajasthani Hospitality at its best! I have yet to meet anyone to match his ardent and unrelenting passion for food! For the three decades that I have known him, he has been whipping up delicacies and ensuring that perfect taste in any dish with his signature touch, whether it is traditional, fusion or gourmet cuisine! 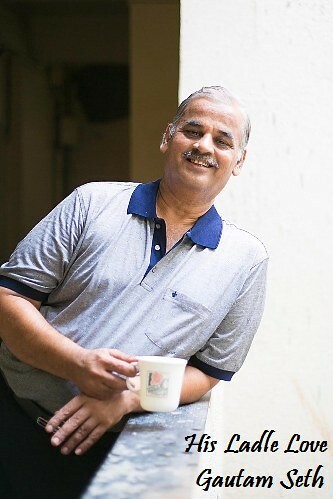 From family cooks conjuring up a wedding feast, road side vendors who take pride in their specialties and chefs at favourite hotels to the women in the kitchen of the large, extended families – the common factor remains Gautam Seth (55): almost always in an avid food discussion with each. He can plan gourmet menus in a jiffy, give recipes and culinary tips at the drop of a hat, and transform uninspired looking dishes into memorable delicacies with a few simple twists. He is also happy to walk the extra mile to source the rarest of ingredients for you – anything for good food is his mantra. In a nutshell, Gautamsa (as I call him in Rajasthani style) is a true foodie at heart. 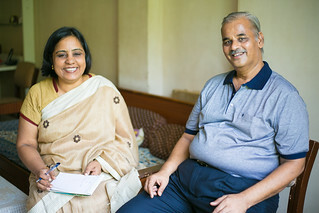 When I went to meet him at his flat in Worli Seaface, Mumbai and we chatted incessantly about our childhood, the joint family and our food preferences. Anticipating my arrival, he had prepared his signature dishes for lunch and planned what to order at one of the new restaurants in town for dinner. He also insisted that we walk down the beach front to his favourite road side joint. The vendor greeted him like an old friend, and served us delicious vada pav in a palm leaf with a flourish. Tell me Gautamsa, what makes you such an ardent foodie? Being a Rajasthani, hospitality is really a part of our life. I have always seen visitors and guests being treated with utmost hospitality and warmth. I have grown up amid wafting aromas and food discussions, so I guess somewhere it rubbed off on to me. Can you remember your first tryst in the kitchen? I can’t exactly say, but I clearly remember that even in my teens, if I did not like the taste of a vegetable dish, I would simply go into the kitchen, place a pan on the stove, and add a dash of ghee and masalas. I somehow always believed that if it’s so simple to transform a dish, then why not do it? Didn’t the elders at home object? No one ever stopped me, so I guess I became even more interested in food. As I grew up, I started making some simple snacks in the kitchen. I never felt lazy about doing that. In fact, I remember doing all kinds of work at home. I was always hanging around Manju Bhabhi (elder brother’s wife) and enjoyed helping her. I am fully aware of the love and respect you have for her and for your elder brother. Surendra bhaisaheb and bhabhi are both an epitome of affection and nurturing. Their unconditional love has always held our family together. Bhabhi has the rare quality of leadership with gentleness. Her devotion to the family and the large extended family has inspired strong family values in all of us. She has been dedicated in taking loving care of my parents as well as all of us. She is a great hostess and even a simple dish cooked by her has such special flavours and her magic touch. Your family’s bonding is indeed a remarkable. In fact over the years, I have seen it grow from strength to strength. Asha (wife): I think the special thing is that even when we moved into nuclear families, the dedication did not change. All of us are there for each other at any given time. In fact, we can always count on our elders for good advice. Gautam: The other couple that truly deserves a special mention is my elder sister by the same name, Manju Jiji and her husband, Ashok-sa Daga. Their dedication and family loyalty has always been something to emulate. They have been a pillar of support for all of us. Looking back, I think I really enjoyed interacting with the chefs in their kitchen over menus and food preparations. It was the same at their family weddings. They always handed over responsibility with such ease and complete trust that it was a joy to be on the host team along with them. With such enthusiasm and passion, how come you did not venture into the food trade? I keep thinking about it. I have always wanted to open a restaurant, dhaba or a chaat joint at least. But somehow I never got around to actually doing it. I have also been busy with my own profession. From my great-grandfather onwards, our family has been trading in precious stones. I continued in the same business, being a jeweller and also had my own manufacturing unit. However, given our large extended families, there have always been opportunities to experiment with food. At weddings, I invariably shoulder the tasks of planning the menus and you are more likely to find me in the kitchen than anywhere else! That’s a really long list (laughs). I like traditional foods, home cooked meals as well as gourmet dishes. I also like to experiment with food. But what I like most is creating dishes with seasonal delicacies. For instance, the fresh vegetables during winter in Jaipur – green peas, juicy red carrots, crunchy spring onions and radish! Not to forget the seasonal green chillies which actually have a mild sweet flavour. Nothing beats the taste of freshly cooked food. A simple baghaar and everyday masalas added to these seasonal vegetables whilst cooking can magically transform them. I have always admired is how you go out of your way to send these to your relatives across India, and I am lucky to have been on your list! The taste of these vegetables makes every effort worthwhile. Don’t you agree? I really enjoy hand picking these vegetables from the market. Absolutely! What about the gen-next? Do they also have a penchant for cooking? Undoubtedly yes. My nieces and my daughter, Shraddha, are all fabulous cooks in their own right. Shraddha experiments all the time, and her dabeli recipe is to die for! Last when we spoke, she was experimenting with some Japanese delicacies: she had managed to get some amazing vegetarian recipes from her Japanese neighbours. And my son Siddharth is one of the best food-tasters I know. More than me, my wife trusts his judgment on the taste of any dish! And what have you prepared for me today? Aloo Pyaaz Sabzi. In fact, Asha and myself prepared it yesterday as we invited our family for dinner last night. She has also roasted some green chillies on the stove and added a dash of salt and lime. I am sure you are going to love that. In fact, the chillies arrived just two days ago from Jaipur and Asha immediately kept some away as since she knew you were coming. So how many kilograms of sabzi did you prepare? And how much of ghee did you add? I am sure it is an extravagant high cholesterol preparation as always! 3 kg potatoes and I kg onions are cooked in a tomato gravy and seasoned with almost 1 kg ghee. This is a Rajasthani specialty. And before you ask me for the nth time, no, we cannot reduce the quantity of ghee or substitute oil for ghee. The aroma is enticing and the taste delectable. But for now, I would like to document something less intimidating than 1 kg ghee. (laughs) Then let me share the recipe of Fruit Pulav. It has that perfect blend of spicy and sweet flavours, and is yet so simple to make. Thank you so much Gautamsa. As always, I am happy to get yet another special recipe from you. First published in November 2014 in Harmony – the Indian magazine for silvers for the column – ‘His Ladle Love’. A series about men who experience the joy of cooking and can weild a deft ladle in the kitchen. Part-2 of this post is the recipe of Fruit Pulav, a delicious rice dish with the gravy of pav bhaji and pineapples.